Connecting and building relationships leads to attracting your best fit clients but sounding like a clinical psychotherapist robot regurgitating hyperbolic cliches is not going to cut it. The true way to attract the best clients for you is by knowing who you help, who you are, and being seen. The true question isn’t “how can I stop sounding like every other therapist?” but rather, “how can I be more me?” because as soon as you are YOU on your website, there is no way you’ll sound like anyone else. There are other therapists with services like yours. You both have gotten similar training, you’re both in private practice, you’re both providing services in the same city, and you both have websites that are trying to attract similar clients in that they are suffering similar pains. But those services that you have, that from the surface seem to be the same as all the other services, aren’t the same at all. The variable is that you are offering the service and there is no one else like you. As the client is looking for a therapist, authentic and unique copy will allow them to know you beyond things like, “I help people with anxiety” or “I have a license”, things that aren’t all that useful to them selecting their best fit therapist. Unique copy will always be more client-attractive to best-fit clients as they can identify you as their best-fit too. There are so many strategies and tools for helping you truly know who your best fit clients are. Whether it’s journaling about them or writing out an ideal client avatar or an empathy map, doing the work of understanding who your unique best fit client is will help you speak directly to them. Knowing your best fit client allows you to connect with them in a unique way. Instead of speaking in broad generalities, as most therapists do, you’ll be speaking directly to those specific pains, challenges, and desires of those you want to help. Generalizations kill that possibility of connection because it’s not actually speaking to someone, it’s speaking to everyone. As the saying goes, if you speak to everyone, you speak to no one, because individuals aren’t everyone, they are them. Just by avoiding this one website copy pitfall alone, your website won’t sound like other therapists because your best-fit client is as unique as you are. So invest time in getting to know your best fit clients. Know their fears, their desires, their pains, their experiences. Go beyond the demographics and into their lives. What is in their darkness? What are they ashamed of? What do they truly wish to have? Use your discoveries in your copy. 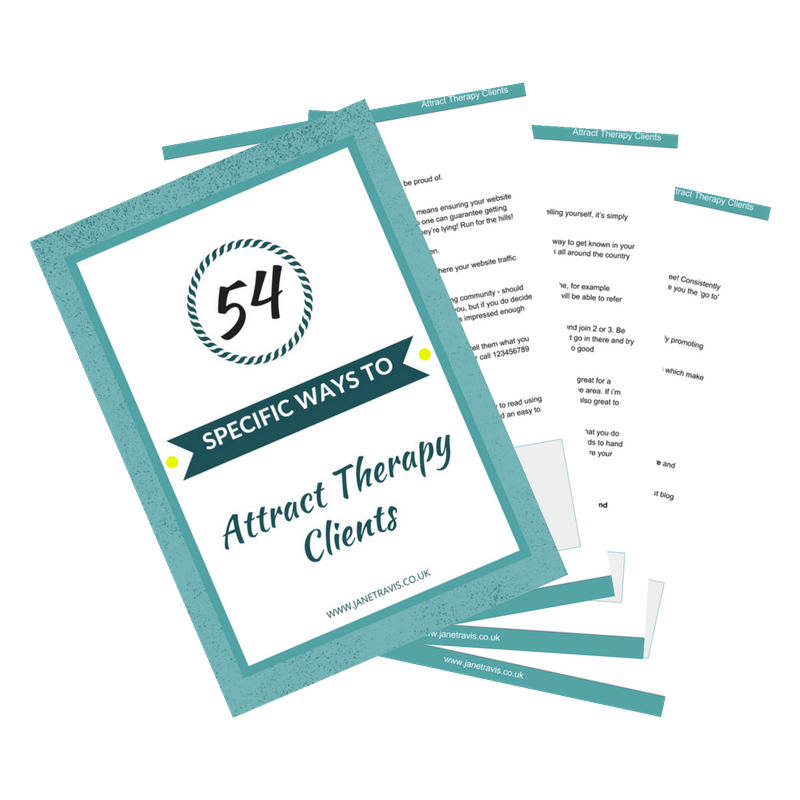 In addition to having a unique best fit client that you’ll want to speak directly to, you also have a unique value that no other therapist has. What do people say is awesome about you? How do people feel when they're around you? Think about the clients that you’ve done your best work with. What would they say about you? Perhaps you are calming and peaceful or maybe you are energizing and motivating. Working to ensure that your website reflects the answers to questions like these will help connect your therapy service to the unique way that you will deliver on the positive outcomes. The way your best fit clients feel with you in real life is the way you want your website visitors to feel on your website. Yes I do recommend that you self disclose. (And yes I can see you squirming in your seat from here). Probably the least comfortable tip on the list is that of self disclosure. Most therapists will say that it’s a concern of ethics. That they are worried that it can harm the therapeutic process. But really, if a client knows that you have a dog named Jerry, is that really going to affect your EMDR sessions? Sorry but I’ll need to see conclusive evidence of this because it’s way too far outside of the realm of reason to be considered an actual threat to healing. Well that, and I would love to see a picture of your dog Jerry on your website because dogs are so cute. If this self disclosure stuff scares you, I’m going to invite you to question if your fears around self disclosure is in fact about ethics or if it’s actually a way that you’re protecting yourself from the vulnerability of putting you out there and being seen. It’s easy to flash your credentials and speak in psychobabble, because it’s not really who you are. It’s like you’re playing that “I’m a counsellor” role that, even if it’s not client-attractive, at least it’s safe. So first, step into the truths of where your fear of self disclosure is actually coming from and recognize that there may be more flexibility there than you thought. If it actually is an ethics concern, do some research into it. I don’t claim to be an expert in therapeutic processes but there are so many ways to self disclose in your website copy that shouldn’t wreck the possibility of healing and will help your best fit clients connect and relate to you. What motivates you? How do you continue to be passionate about therapy? What beliefs do you hold that are important to your services, your approach or to the world? What stories or experiences from your life speak to how, what or why you do therapy? Using story is a great example of how to self disclose. Tell stories from your normal life that tie into something about the benefits of working with you. The stories don’t have to be epic, just human. Like that one time that I was having one of those days. Those days when everything is going wrong. I was late for an appointment, I spilled my coffee on my new white dress shirt, and also got a parking ticket. It was one of those days when one stressful thing leads into another stressful thing and it reminds me of how it feels to have anxiety. Ok, not the most graceful segue there from story to mental heath but have you had a day before? Will sharing about spilling coffee on a new white dress shirt ruin therapy? Probably not. But it makes me understand that you’re a human. Just like me. And not that robot speaking clinical psychobable I referred to earlier. Self-disclosure, to whatever degree you can break into, is a great way of not sounding like every other therapist. No other therapist has your unique life experiences or ability to connect those experiences to things that are important to healing. Bringing those out makes you unique and also relatable. You’re a human too and being human on your website will yield deeper connections with your best-fit-clients-to-be. If you are worried that you sound like every other therapist on your website, you probably do. There’s no magic formula to change that really, it’s simply about developing enough awareness about who you help and who you are so that you can communicate that clearly. Many therapy services will share similar benefits and outcomes or similar modalities used to get there. You might even have offices down the street from each other! But when it comes to not sounding like other therapists, knowing your clients, knowing yourself, and sharing a bit about who you are is the way forward. Being yourself on your website is not always easy. There are the preliminary steps of self-discovery, which aren’t always easy. If you don’t have clarity on who your best-fit clients are or what makes you a superhero in the therapy session then you may need to do some work at those levels before you head into the writing and editing part. Plus you have to factor in the work of overcoming the fear of being seen through self-disclosure. But the work is so worth it. It’s so worth it to be clear and be yourself. And you owe it to yourself and your potential clients to be a self-aware and open professional that is able to guide clients towards you so that they can get the help they need. It’s impossible to sound like every other therapist when you accept that there is only one you doing what you do with the way that you do it and set out on a mission to communicate that. The mission is now clear, you just have to embark on it.